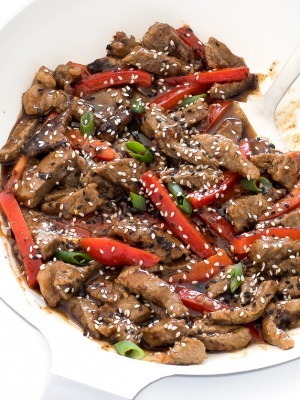 Super Easy Sesame Beef. 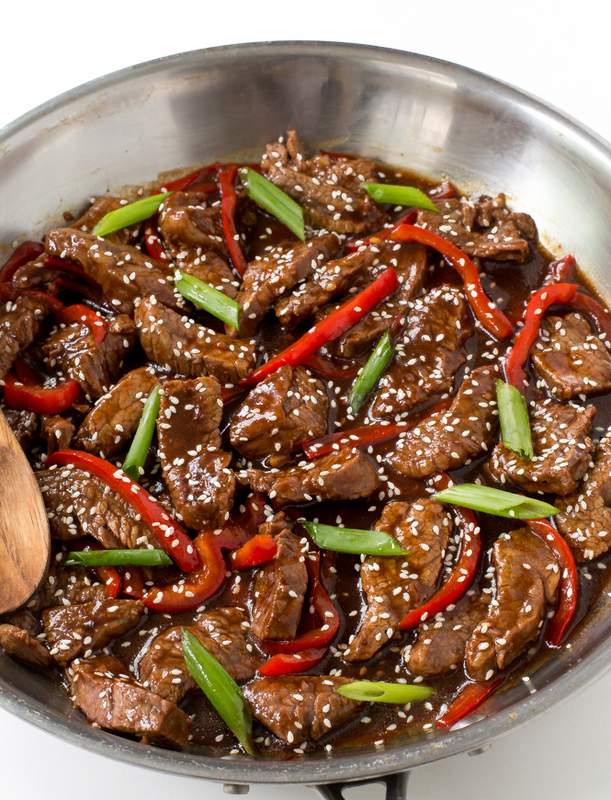 Tender flank steak stir fried with red peppers and green onions. Better and healthier than takeout! 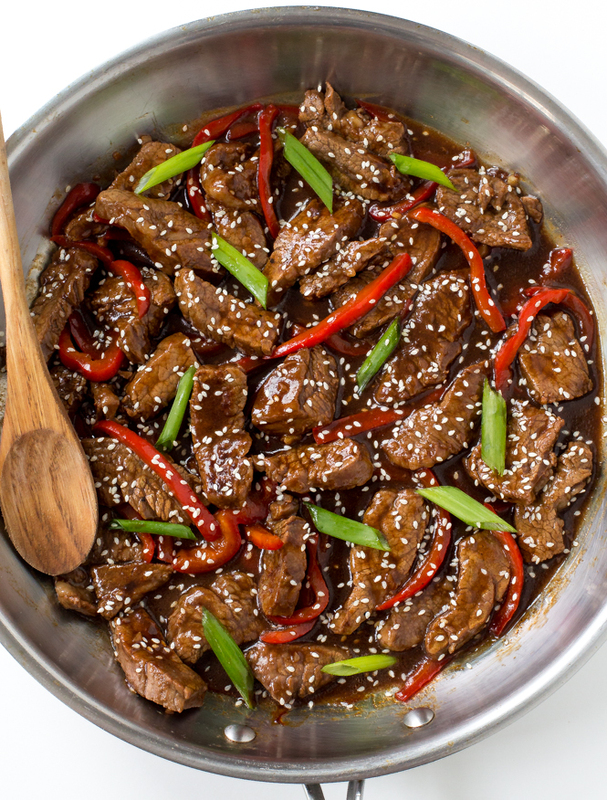 This Sesame Beef is AMAZING and so simple. Marinade the beef overnight and you have a quick and easy meal to throw together the next day. This dish is just like the Sesame Beef you get at a takeout restaurant except it’s even better AND healthier. 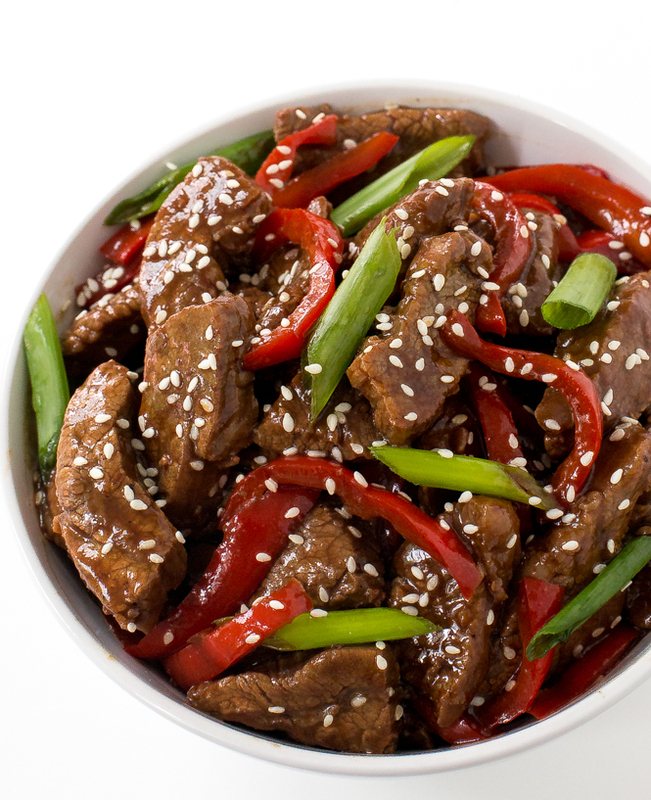 Most Sesame Beef recipes are fried in oil. I went on the lighter side and stir fried the beef instead. It’s just as juicy will less oil and calories. 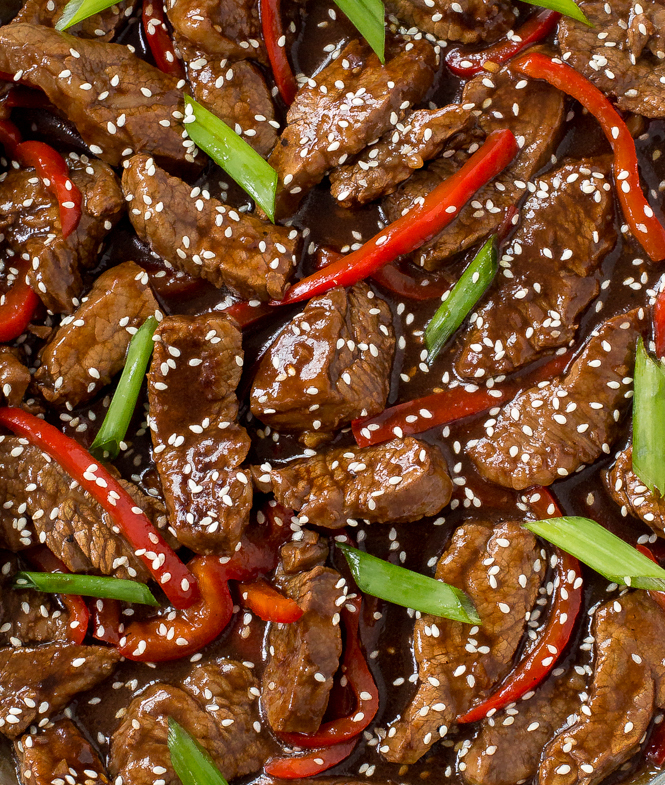 One of the best things about this Sesame Beef is the sauce! 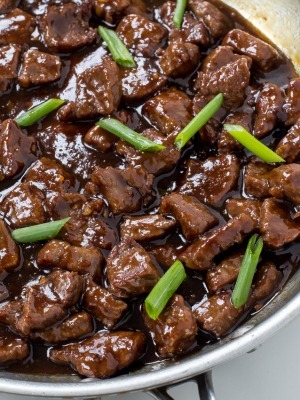 The sauce consists of brown sugar, dark soy sauce, regular soy sauce and water. I use half of the sauce as a marinade and the other half to cook with the beef. The trick to this dish is cooking the steak quickly over high heat. It gets a nice sear on the outside but stays nice and juicy on the inside. I like to serve my Sesame Beef over fried rice or noodles. Either way it’s awesome. Enjoy! Add both soy sauces, brown sugar and water to a medium bowl and stir to combine. Add steak to the other 1/2 of the sauce and marinade for at least 30 minutes or overnight. When you are ready to cook add sesame oil to a large skillet or wok. Remove steak from marinade and saute for about 1-2 minutes on each side. (You want the pan to be very hot so the steak cooks quickly and browns. Add red bell pepper and saute for 1 minute. Add in the reserved sauce and bring to a simmer. In a small bowl combine cornstarch and water. Slowly add cornstarch mixture to pan. Continuously stir until sauce is thickened, about 1 minute. Serve immediately with green onions and sesame seeds for garnish if desired. Thank you Nathan! Is this for one serving or the whole dish? It seems like it’s per serving. There is way more protein in a pound of flank steak. 100g of flank steak has approx. 28g of protein. What other cuts of meat would work besides flank steak. I have a beef share and rarely get flank, but have lots of roast, stew meat , sirloin and ribeye. I would say the closest to flank steak is skirt. However out of the ones you listed I think your best bet would be maybe the sirloin! I hope that helps, Thanks!